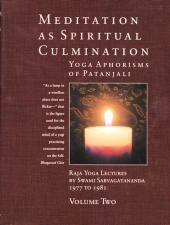 A collection of the transcripts of 132 Raja Yoga lectures given by Swami Sarvagatananda on the Yoga Aphorisms of Patanjali. Here's an incredible book on the day-to-day practice of meditation by Swami Sarvagatananda, the previous head of the US Boston Center. The book has a Western approach by a swami who lived in the US for many years. 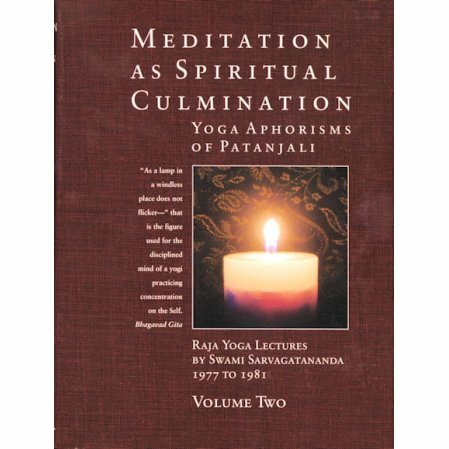 It's two huge volumes covering 1611 pages of 132 night class talks from 1977 to 1981 on Raja yoga and the Yoga Aphorisms of Patanjali. About thirty of us, college students, professors, office workers and retirees had the good fortune to participate in these classes. It was a character transforming experience for us. We learned that Raja Yoga deals primarily with the mind and its control. But this control cannot be attained without leading a pure life, full of loving concern for all, and reflecting rather than reacting to negative thoughts or circumstances. As the classes progressed, the intensity increased. We listened in fascination as the swami went deeper into the intricacies of the mind, the method of concentration and its culmination in meditation. The swami's intimate knowledge of this difficult subject enabled him to clear up all our doubts in simple yet convincing language in a question and answer session at the end of class." Raja Yoga means the Kingly Path. Why is it called so? Here nothing is based on imagination, or any kind of belief, or faith, or conviction or authority. This is one discipline which helps us to grow, to evolve and to gain depth, not from the outside but from within. The mandate is from within. Raja Yoga tells you: “Be strong, be courageous, have the ability to say ‘no’ to your negative thoughts. Look at them squarely when they come up to the surface consciousness.” That is, be fully aware what is going on in your mind, fully conscious, deliberately look at them; and when the war goes on between he conscious and the unconscious, when the unconscious urges come up, you are not absentminded, you are alert. There is nothing in your mind that happens without your knowledge, but you don’t catch it as you don’t hold your mind. Without knowing this art of holding the mind you still can be a great scientist, great surgeon, great poet, great philosopher as these are of a different type altogether. Turn the mind in, look within, not out. It is easy to look out, easy to analyze things outside, but you cannot easily analyze things inside, what is happening in your mind. A yogi is one who: controls his mind, analyses his mind, examines his mind. Every thought, every impulse, every urge, every modification, he examines thoroughly. This is a definite process. A time comes when you become aware of all your thoughts, tendencies, urges and modifications. You stand up and say: “All the devils are in me – and all the gods are also in me. We chase them, we criticize them, condemn them. A yogi does not do that, he turns within. ... When you look within, you find that you have the same situation.That is why Goethe made that wonderful statement: "There is not a single crime in the world which I might not have committed.” We have the desires of robbers and murderers in our minds, but we don’t manifest them because we know they are not good. This comes when you are fully awake, mindful, alert, catching the glimpse of the urge or modification that comes from inside .... That is only possible when you are calm, quiet, deliberately awake and aware..."
There's no doubt this is a huge book filled with information. The beauty is that it's from the swami's lectures in the West explaining all you need to know about meditation and its practice. Highly recommended..